Descendants and researchers need to be aware that omissions, errors and inconsistencies have been identified in the records now available for Newcastle and Biloela – most particularly in the Entrance Book – so caution should be used when researching ancestors whose names appear in this record. This major reference is incomplete but this is not immediately evident when viewing the actual reference material and this is even more difficult to notice when viewing images of the document. The original document has been filmed and is therefore now no longer available for retrieval at SRNSW. The complete list of 193 inmates of the two schools in Newcastle have been identified in two letters held in the Colonial Secretary 'In' Letters (CSIL). One list named the admissions to the Newcastle Industrial School and the other named the separate Newcastle Reformatory admissions. Personal details of these girls may be found by cross-referencing the Entrance Book, letters relating to inmates from the CSIL, letters and reports from the superintendent, newspaper articles, the NSW Police Gazette and the NSW BDM Index and this is what has been achieved on this site. More importantly, in most cases, the families of the girls admitted to Newcastle have been identified even if those families were never named in the Entrance Book. It is thought that the register of the Newcastle Reformatory, which has not survived and almost certainly included admissions to both the Biloela Reformatory and the Shaftesbury Reformatory to 1887, would have been completed in a similar fashion to those from the Industrial School as each was commenced by Agnes KING. Staff appointments have been compiled from the NSW Government Gazettes, Public Service Lists and from correspondence in the CSIL. Note: All statistics listed below have been compiled from the amalgamated records of the 193 inmates who were sent to Newcastle – 187 to the Industrial School and six to the Newcastle Reformatory. Images from the Entrance Book are now available on Ancestry within the 'New South Wales Schools, Directories & Church Histories' section.4 Ancestry has identified the location of all the girls named in the register within the Sydney locality of 'Parramatta' and the SRNSW Index, using the title of the actual record, indicated that admissions were made to either the second school, Biloela, or the third school, Parramatta. The first 118 girls named in this record were sent, often from Sydney, to the Newcastle Industrial School – the first Government run institution for girls that operated under the act of 1866. 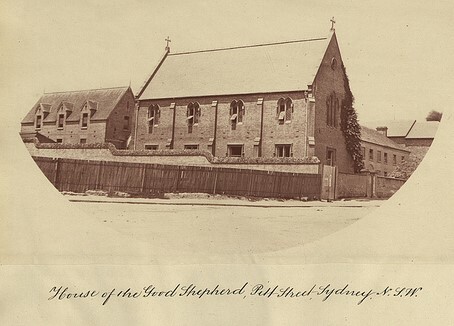 The register is arranged chronologically and covers admissions firstly to Newcastle Industrial School, then Biloela (Cockatoo Island) and finally, Parramatta Girls' School until 1912. The record is clearly labelled Entrance Book and was almost certainly not a register of warrants. The numbers recorded in the register are very unlikely to refer to warrant numbers even though a warrant was almost always issued for the arrest of any girl admitted to the school. The numbering of the admissions simply refers to the order that the girl appeared in the register. That order was usually, but not always, the order in which they were admitted. The condition of the Entrance Book is truly remarkable for a book used at least weekly for over half a century. With careful inspection of the original document it becomes apparent that at some stage in the past the register had been rebound. During this rebinding approximately forty pages were not included and it is thought that these pages were missing well before the rebinding occurred. These pages have therefore not survived. Included in the lost pages was the date and notation that identified that a transfer from Newcastle to Biloela had occurred.9 The remaining last page of the Newcastle admissions and the remaining first page of the Biloela admissions therefore appear side by side and are tightly bound giving the impression that the information recorded on the second page refers to the names on the first page. This is not the case. The handwriting of each page differs and when turning the page, the previously consecutive numbering jumps over 100 places. While the records of the initial intake of girls admitted to Newcastle from 31 August 1867, until 7 October 1869, are documented in the register, from October 1869, (Admission Number 119) until 6 November 1876, (Admission Number 345), inmate names and all their details are missing. These missing pages would not only include admissions of girls but would also identify any young boys who were to be sent to the Industrial School for care by the Matron after the change to the act in 1869. The record for the first boy named in the incomplete Entrance Book has the admission number 351, thus confirming that the names of young boys were recorded in the same register as the girls. Four boys have been identified from the missing pages in the Entrance Book but these young boys were all admitted to Biloela. No boys were named in the one complete list of admissions to Newcastle that has been located.10 None are named on the transfer lists to Biloela11 and no indication of any transfer from Newcastle to the Vernon appeared in the Vernon records. In addition to this lack of written record, coincidentally, during the period when the admission of boys to Newcastle could have occurred, one boy under the age of seven was arrested with his sister in Newcastle. It could therefore be logically expected that in this situation this six-year-old would have accompanied his older sister to the nearby Industrial School rather than to be sent alone to Sydney but this boy was sent by boat to the Vernon on Cockatoo Island.12 Therefore there were no young boys ever admitted to the industrial school at Newcastle. Information on the boys who were admitted to the boys' industrial schools, the Vernon and later the Sobraon, is also available on Ancestry in the 'Schools, Directories & Church Histories' section. The Vernon records complement those of Newcastle, Biloela and Parramatta. The names of any Vernon and Sobraon admissions do not appear on the Child Welfare Index on the SRNSW website unless they were young and were sent to Biloela or Parramatta. An attempt to identify all the young boys and girls who were sent to Biloela before November 1876 is still being undertaken. The list of these missing admissions may be viewed on this site on the page named Biloela. When girls were admitted to Newcastle their place of arrest was not recorded. The Entrance Book documented the police court at which they appeared. An analysis of the court locations for the 187 inmates from the Industrial School and those six from the Reformatory indicated that the largest number of admissions were made from Sydney and its environs (90) but slightly more than half the girls (103) admitted came from the country areas of NSW. The location of the trial of two girls in the missing section of the book is yet to be discovered and remain unidentified even though an exhaustive search has been undertaken. It was extremely rare that families of sisters were admitted from Sydney and there was only one instance where more than two sisters appeared in the Sydney courts and these trials occurred separately. In country areas there were instances of three or more sisters facing court and subsequently being admitted – the most being the cases of the SOLOMON and STANTON sisters from Newcastle and Maitland respectively. Each of these two trials sent five sisters to Newcastle. Researchers need to consider that at this time in the history of Australia, less than eighty years after European settlement began, many factors contributed to variations in the spelling of surnames in NSW. The Australian accent as we know it was still to develop so an accent could be considered a reliable indication of a person's place of origin. It was almost certainly very difficult to lie about your country of birth at this time. During the mid-1800s the majority of the population was made up of people from all parts of the United Kingdom and Ireland. A large number of people had been born in Australia. Some had been transported and some had arrived under the different immigration programs offered. There were also a small number of assisted immigrants from Germany and a small number of transportees had arrived from different locations across the British Empire.15 The dependency of Australia on sea transport also meant that ship crews from Scandinavia, South-east Asia or the Iberian Peninsula, often stayed to work on the coastal traders or alternatively, jumped ship to seek gold. Many others from around the world worked a passage to one of the Australian colonies. The gold rush of the 1850s had brought more immigrants. Large numbers of Chinese came to prospect or provide services to European communities. The resulting Chinese community grew and existed on the fringes of every large town. Opium dens were common. This multicultural community contributed to a difficulty in recording surnames for many reasons. Spelling and punctuation expectations were different to the standard in use today. Not everyone was able to write their name and even transcribers of names may not have been particularly well-educated. The circumstances of each incident of recording a name may have contributed to variations in the spelling of names. Was either party suffering from intemperance?18 Did the speaker have a speech impediment? How good was the hearing of the person transcribing the words? What experience did the recorder have with the particular accent? Interpreting different handwriting with its assortment of tears, blots, blurs, blotches, smudges, water spills and, as time progressed, fading, have ensured further variations. Was the transcriber reporting accounts written by a third person? Investigation of newspaper reports indicated that the handwriting of reporters 'on the ground' was not correctly scripted into the papers by compositors. Further, compositing errors may have occurred19. When messages were sent by telegraph, further errors occurred20 so the spelling of surnames in the Police Gazette is often quite different to that recorded in newspapers and/or the Entrance Book. It has been found that some of the inmates of the Newcastle Industrial School adopted or acquired an alias. The most common situation occurred when a girl was given the alias by the constables or courts as a result of her mother's associations – usually with a man who was frequently her partner.21 These girls were frequently admitted with two names and rarely, if ever, used the alias. This situation was often dependent upon the girl's age when her mother entered the relationship22. The Act for the Relief of Destitute Children 1866 stated that girls under the age of sixteen years could be admitted and that those girls were to remain in the school for a minimum of twelve months. Once they had attained the age of eighteen years they were to be released if they were still in the school. Girls arrested under the act who were sixteen years or older had therefore been admitted illegally. If a girl was older than sixteen and was admitted to the school, parents were required to prove her correct age before the government would approve her release. A large number of girls were often years older than their recorded admission age. It has been found that ages recorded in the Entrance Book varied from the actual age in a number of cases. Comparisons between the Entrance Book, a court report and a confirmed birth reference have been made where this has been possible. Compilation of all the records available for each girls admitted to the school has resulted in the identification of girls whose actual age differed from their admission age. There have been a number of reasons identified that may explain these age differences. The ages of sixteen of the girls admitted during the first four months were written in pencil. All of these girls were reported in the newspapers as 14 or 15 but were record as 16 years or older in the Entrance Book. They had therefore been illegally admitted. It is thought that this occurred because school administrators suspected that these girls were older than the legal age of admission but they were not generally in a position to question or prove the correct admission age. These recorded ages in the Entrance Book do not match ages reported to magistrates in court appearances and while they were therefore admitted to the school illegally, the reason for the illegality usually rested with the information provided to the authorities. Information about inmates may have been either intentionally or inadvertently wrong and KING's reports and CLARKE’S letters reflect their difficulty and frustration in assessing age. The Entrance Book recorded that a third32 of the girls admitted during the first month were documented as already sixteen years of age or older. This suggested that personal details about age and family were provided by the inmate and not verified, or able to be verified, by any other source including Baptism records, the arrest warrant and court details. The superintendent, CLARKE, complained to the Colonial Secretary concerning irregularities in admission ages. Some girls may have understated their age to try to avoid being gaoled for prostitution, not realizing that an admission to the Industrial School would result in a longer confinement under the terms of the Act. Parents then had to prove the correct age.35 This seems especially true during the early days of the implementation of the law and may possibly be attributed to the lower literacy levels and socio-economic status of most of the families of the inmates. These families were less likely to have read the newspapers that informed the community of the planning for the implementation of the law as communications concerning the new law was reported in the written media and may therefore never have reached those families most likely to be affected by the Act for the Relief of Destitute Children. It was known, or eventually became known, by the general population that lying about a child's age in court ensured an admission to Newcastle and later Biloela even though that resulted in an illegal arrest for the girl. Parents deliberately lied to get a warrant to enable the removal of their child from a deprived circumstance, a situation of danger or possibly their own apathy.36 The child may have then told the truth when they arrived at the school. The recorded age of the oldest admission was nineteen and this girl was the first entry in the Entrance Book. She50 was recorded in her court report as fifteen but was eventually proved to be too old to have been legally admitted and was returned to her mother. Her case and other similar cases51 indicates that the Entrance Book contains evidence of either deliberate lies or unintentional errors in age or in other family details. Of the thirty girls admitted to the school during the first month,52 ten were already sixteen years of age or older. This trend continued but the proportions of older girls reduced. An analysis of the ages of the 193 girls admitted to Newcastle shows that 12% were sixteen or older, 30% were fifteen or older and 45% were fourteen or older at the time of their admission. Because girls were to remain until the age of eighteen unless they were apprenticed, this group of older girls grew and this increasing number of young women was very likely to contribute to the difficulties in maintaining discipline faced by the school authorities. 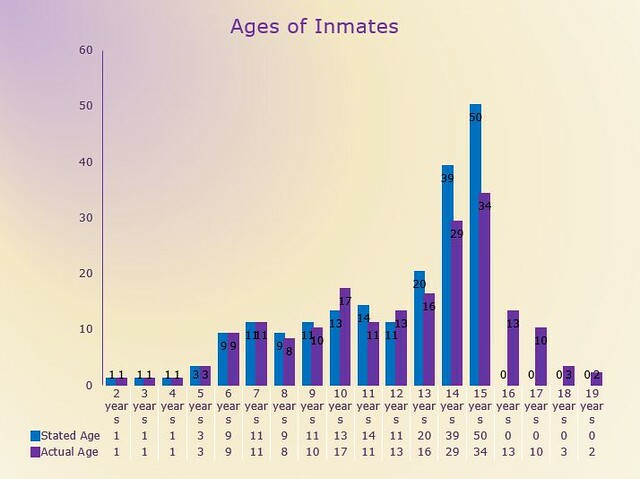 The youngest inmate was two years old.53 Of the 193 girls admitted to Newcastle, 6 were five or younger and fifteen were six or younger. When a child is this young at the time of her admission and was not in the company of sisters, or, her return to her family was not possible or was never requested, she was unlikely to know the names of her parents. When she married she was therefore unable to provide their names. The following letter, addressed to the Superintendent at Parramatta Industrial School, provides an insight into the situation these younger girls faced. It was written on 13 June 1911, and appeared in the Entrance Book near the name of Annie HINES54 so presumably the information she desired was furnished. I am sending a stamp for an answer. A major aim of this research was to identify each girl's parents – especially where they were not identified in the Entrance Book. In most cases this has been possible and the process is ongoing. It does not seem to have been the intention of the government to identify a girl's family, therefore parents may not have been named. If a parent was deceased, they were identified in the record as 'dead'. Notations indicating 'both parents dead', 'mother absconded', 'father in gaol', 'mother dead' are common. Although no statistics have been found for Newcastle, those that were published from the Vernon suggested that the government was collecting information about the situation in which the children arrested under the act lived. Rare statements gleaned from letters held in the CSIL indicate that more was known of the antecedents of the inmates than was recorded in the Entrance Book. Evidence remains that knowledge of the criminal history of parents – whether their recent criminality or their convict history is uncertain – was used by officials against rebellious or unruly girls55 or was used by members in the Newcastle community who were in a position to know, who could identify more 'desirous' inmates who perhaps would be more trustworthy apprentices.56 Currently the parents of 184 inmates have been identified. Anomalies have been found in the information contained in the records. These errors almost certainly indicate that in many cases personal details were provided by the girls when they were admitted or when they appeared in court. To date only one warrant has been retrieved from the CSIL and this verified that girls were asked to provide their details. The warrant for Sarah AUBURN clearly recorded that her 'Nature, and Proof adduced as to Age', recorded on the warrant and subsequently in the Entrance Book, was by 'her own statement'.58 This method of ascertaining age was almost without doubt adopted with every girl admitted if no further more reliable evidence was available. The warrant of Sarah AUBURN was in the name Margaret WHITE as she had fabricated both an alias and family details at the time of her arrest because she was running away from home. The Entrance Book recorded the alias as her correct name and her real name was recorded in pencil. Based on the information recorded on the warrant, the Entrance Book would have indicated that her father was dead and her mother had remarried James WHITE,59 but Sarah's family page is the first missing page of the record so what was actually recorded there cannot be confirmed. The father of Lucy AH KIN who was admitted in 1868, was not named and was recorded as dead, yet a receipt60 from 1871 showing that Le AH KIN had financially supported his daughter while she was in Newcastle. Lucy may have been deliberately dishonest due to the circumstances of her arrest. The mother of Catherine SMITH (2) had had her admitted to Newcastle with a warrant. Her admission only recorded that her father was dead and didn't identify the name of her mother. It is considered likely that Catherine refused to provide this information due to her anger at the circumstances. The father of seven-year-old Mary ALLEN was recorded as Thomas. Subsequent correspondence from Mary's uncle,61 supported by entries in the Police Gazette,62 proved that this record was wrong and that her father's name was William. His identity wasn't known in the area of Mary's arrest and as Mary was quite young when she was arrested it is considered that this was not a deliberate falsehood. There is no clear explanation as to why the record is in error but it is conceivable that Mary's brother, William, was known in the family by the pet name, Thomas, and Mary knew him to be named after his father. Twelve-year-old Mary Ann KINNAIRD was admitted with the surname KINNEAR. Her father was recorded as James and her mother as Mary Ann. A petition from 1872 proved that her father's correct name was Thomas. The entire entry in the Entrance Book appears to have been a deliberate lie told by Mary Ann as the alias is pencilled in later and was almost certainly added once the falsehood was discovered. Court appearances for Thomas show that he also used both surnames and was well-known in his home town as a frequent offender so it is thought that Mary Ann 'took the heat off him' by lying. Subsequent research has verified that the correct surname should have been KINNEAR and that KINNAIRD was the alias which has subsequently been used by all descendants. The father of eight-year-old Rachel WILLIS was recorded in the book as William but was he was identified as Thomas at the time of her baptism. When Rachel was arrested her father hadn't been living with his family for over five years, but her mother, who was alive, wasn't named. It is unknown why this is the case but Rachel may not have known her father because she was a baby when he disappeared. It is also possible, but less likely, that Thomas was actually an alias used by Rachel's father and his name really was William and Rachel told the truth when she was admitted. The family information on the admission of Fanny DARLING in the Entrance Book recorded the name of her mother and stated that her father was dead. Petitions from her father and the registration of the death of her mother show this entry to be incorrect. It is likely that Fanny knew nothing of her father but her mother was familiar. The COE sisters were in the care of someone who wasn't related to them and were admitted with the name of COLE. It is unknown whether this was deliberate or unintentional as both girls were aware of their correct surname as they used it after their discharge from the school. It is unknown whether they or their carer provided the information on their warrant and in the Entrance Book. There was, with one exception, no reference made to the ethnicity of the girls in Newcastle when they were admitted. The admissions were almost exclusively girls of European63 ancestry and in every case at least one parent was European. The distribution of religion gives a broad indication of the number of girls who may have been Irish or of Irish descent. Only one girl was recorded on her admission as having Aboriginal ancestry64 and research has to date identified only one other inmate who was of Aboriginal descent.65 One of these girls was living within the European community and not with the aboriginal community. The arrest details of the other have not been located. One girl had Chinese ancestry66 but her ethnicity was not noted in the book. The records associated with other girls or their families suggest other, less common, heritage – German,67 African,68 Portugese69 or Gypsy70. Note: While unconnected with the Entrance Book, the choice of husband, partner or liaison made by many of the girls shows the diversity of the nationality of men in NSW during the 1870s and 1880s. Eleven of the girls, although of European ancestry, made relationships or marriages into the Chinese community or married an East Indian sailor or Pacific or South Sea Islanders. Many others made marriages to Italians, Portuguese or Spaniards. The first 94 admissions to the school show a far more comprehensive assessment of reading ability than later admissions whose ability is only recorded as 'read.' No further analysis has been undertaken but there appears to be no correlation between age and reading ability in these records. An individual level of attainment for reading is recorded. The first 94 admissions to the school show a far more comprehensive assessment of writing ability than in later admissions who are only recorded as able to 'write.' No further analysis has been undertaken but there appears to be no correlation between age and writing ability. An individual level of attainment for writing is recorded. Membership of Christian faiths was the only religious data collected. There was no distinction made between the Protestant religions. Because many individual records are in the missing pages of the Entrance Book, confirmation of religion cannot easily be made. The Biloela transfer lists do contain a notation of religion so if a girl was still in the school in May 1871, it is possible to know what was once recorded in the missing pages in the Entrance Book.71 The records that do exist indicate a slightly higher number of Roman Catholics than Protestants. Further details concerning the arrangements for religious insrtuction may be located in The School. Preparation for future employment was provided by the school in addition to formal academic lessons. The circumstances under which a girl was discharged from the school varied. The vast majority of discharges from Newcastle were into apprenticeships or placed in service but girls were also discharged to their friends or relatives or to another institution. Two girls died in the school. Sometimes prospective employers wrote to the Colonial Secretary requesting a particular or suitable girl to work for them but most often the superintendent sourced placements for inmates and negotiated the terms of the apprenticeships. Remaining records indicate that the superintendents Joseph CLARKE and Selina WALKER and the relieving superintendent, John DALE, worked hard to arrange suitable apprenticeships. CLARKE was very careful to match religions and checked how the apprenticeship was working. He also responded quickly if a girl made a complaint of mistreatment. Mostly the girls seemed to be treated well and the little evidence that remained of their experiences was positive. One or two instances of mistreatment have been identified. Most girls were apprenticed as domestic servants. They cleaned, cooked and helped maintain the large properties employing many men as shearers, shepherds and labourers. Apprenticeships to private families also occurred and girls did domestic chores or were employed as housemaids or nursemaids. Apprenticeships to learn a trade were less common but opportunities to learn the trades of dressmaking or upholstery were identified. For apprenticeships arranged by CLARKE, remuneration for the girls varied and he was required to negotiate terms for each individual. Little evidence remains for rates of pay for any apprenticeships arranged by LUCAS as few letters for those that he discharged appear in the CSIL. By the time DALE and then WALKER took over the Superintendency, wages for apprentices appear to have been standardised. Further details of the process of arranging apprenticeships for girls are outlined in The School. Not every record in the Entrance Book provided information about a girl's discharge and not every girl without this information went to Biloela. Discharge notes for all inmates who left the school before April 1872 appear on one complete list in the CSIL.74 Wherever possible discharge details have been retrieved from individual letters in the CSIL. Note 2: Numbers of discharges exceed 193 because some girls were readmitted to the school and were therefore discharged at least twice. Individual letters show that an investigation into the circumstances of parents by the police occurred if a request was made for a discharge of the girl to her parents. A police assessment of the circumstances of the parents was then undertaken by the police and the request was often refused if there was some suspicion about this suitability or ability to care for the girl. The opinion of the Superintendent was also sought and this opinion carried considerable weight to the eventual decision. Letters concerning the placement of apprentices at this time indicated that CLARKE, the superintendent, attempted to match the girls with their prospective employer but it is unknown whether this was due to a directive or personal care choice. He appeared to have ensured that their religions were matched so there was less likelihood of conflicts occurring. In the case of ??? he reported to the Colonial Secretary that the difference in their religions was unlikely to be an issue. Lists and individual letters relating to inmates are indexed on fiches held in State Records of NSW, Kingswood, which also holds the original letters. As at May 2013, none of these letters have been filmed so are only available at SRNSW in original form. Some letters are personal requests from those connected with the girls to either the superintendent or the Colonial Secretary. Some are letters from the different superintendents concerning discharges, punishments and apprenticeships. Not all the girls admitted to Newcastle are mentioned in the index or the correspondence. Difficulties in interpreting the handwriting of the period mean that some names in the index are very different to the girl's actual name. It is rare for Reformatory girls to be identified in the Index as coming from the Newcastle Reformatory. Some of the letters in the CSIL contain lists of the girls who were sent to Newcastle. The most significant are ranked here in order of importance and relevance. Although not specifically named in the CSIL Index, the letter SRNSW: CSIL: 71/3610 [1/2144], contains four lists compiled on 1 May 1871, in preparation for the transfer from Newcastle to Biloela. They are: a list of all the girls in the institution on that date and any returned to the institution before the transfer; a list of the girls aged ten or younger who were to make the transfer; a list of the girls older than ten who were to make the transfer and a list of the girls in the Reformatory. These lists record admission age, current age, admission date, religion and occasionally, remarks. A list, probably compiled for the NSW Government in mid-1872, requested information concerning the girls at the school.84 To date one list that pre-dates this request has been found.85 It contains the names of the 187 girls admitted to Newcastle and includes their chronological admission number and discharge details. The admission number of four of these girls (numbers between 105 and 108 inclusive) varies slightly from their admission numbers in the Entrance Book. It also includes the names of the first girls admitted to Biloela. There are no boys listed. To date this is the only complete list of the Newcastle girls located but there are thought to be others closer to the August date that haven't yet been located. Some transcription errors in both given names and surnames have been identified on this list. It is conceivable that further errors occur on this list with records for the girls whose names appear in the missing section of the Entrance Book but because the original record is missing, it is impossible to cross-check them. A letter to the Principal Under-secretary in 1874 names the girls who were admitted to the Newcastle Reformatory and the Biloela Reformatory up until April 1874. It includes details of the trial dates and locations for the first nineteen girls admitted to the two reformatories.86 This is the only known list of the Reformatory girls. The 'July 1867 List'87 was compiled by the constables of Sydney in July 1867, one month before the first arrests were made. It contains the names of thirty-eight girls who were considered by the constables to fall under the terms of the Industrial School Act. Not all of these girls were sent to Newcastle but the list contains valuable information that hasn't been found in any other reference for those who were ultimately admitted. The preface to this letter suggest that constables across the state were also asked to compile a list for their area. A list naming the at risk boys of Sydney was also compiled and is dated 14 May 1867. This record is also not specifically identified in the CSIL Index but it may be located at CSIL: 67/585 [4/615]. CLARKE's 1870 List88 was compiled on 1 August 1870, by Joseph Hines CLARKE, the Superintendent at the time, and sent to the Colonial Secretary in response to what CLARKE considered adverse and erroneous publicity. He reported on the welfare of the forty-seven girls discharged by him after his arrival as Superintendent late in 1868. It adds new details to the family information outlined in the Entrance Book and reports on the progress and behaviour of each girl after she was discharged from the school. He also includes some statistics showing how few of the discharged girls had 'gone to bad.' It is one of the first examples of welfare follow-up for any Government Institution in NSW. Shortly after the school transferred to Sydney, LUCAS compiled a list of girls who were eligible for service.89 Under the terms of the act, these girls must have been admitted to the school at least a year earlier. The first forty-one names in the book are duplicated in a letter on 2 November 1867, from the Superintendent Agnes KING90 to the under-secretary. This list contains almost no additional information on the background of any of the girls. Two assessments for each inmate were made on her admission. Educational attainments in reading and writing abilities were assessed. Medical observations and a physical examination by the visiting medical attendant also occurred. The list compiled by Dr. Richard HARRIS91 on 14 November 1867, called A Synopsis of the Inmates of the Newcastle Industrial School, records the results of a physical examination of the first forty-two girls in the school. Two had ringworm. Twenty-five were recorded as virgins and of the remaining seventeen, all except five were sexually healthy. Of those five, two had gonorrhoea and three had syphilis. Records of subsequent examinations have not been located, but CLARKE refers to HARRIS having a list of the Signs of Virginity for the first eighty girls. HARRIS was instructed to stop this physical examination once CLARKE became aware that it was occurring but HARRIS did not comply and this created considerable friction between the two men. This register92 records a chronological list of copies of the letters and memos of Joseph Hines CLARKE from shortly after his appointment as superintendent until 18 March 1871. It is a fragile record containing duplicates of his correspondence written on tissue paper. The first pages are missing. The record contains copies of reports to the Colonial Secretary, communication with members of the public and potential employers and in-school memos. The content addresses the issues of the administration of the school, the maintenance of the site and letters about individual girls or members of staff. Some of these original letters have been recorded in the CSIL index but the originals for some of the copies do not appear in the CSIL index so must be tracked through the register of letters on microfilm which has not yet been done. CLARKE's letters also contains the names of some Reformatory girls as copies of letters pertaining to the reformatory may be found within the record. Newspaper reports of trials under the act often contain the names of family members and are very valuable as almost no Police Court documents remain. The invaluable resource, Trove93 at the National Library of Australia (NLA), has enabled access to the newspapers of the time. Any records found on Trove relating to individual girls have been corrected so they will be found on a name search. As yet unscanned papers or papers undergoing the scanning process – Newcastle Pilot – issue 1 on 6 September 1867,94 Goulburn Herald and the Goulburn Evening Penny Post – have also been viewed and as these papers are scanned, even more details may be discovered. It is believed that no newspaper reports for arrests at either Penrith or Parramatta were ever recorded in the newspapers. None have been found but more significantly, reports were regularly glued into Entrance Book for the Vernon and no reports for boys tried in these locations have been found in the Vernon admissions records. The record named as the Industrial School Discharge book95 commenced on 4 January 1876. It gives the discharge date of girls who were at Biloela but only included references to Newcastle girls if they were very young when admitted to Newcastle or were readmitted to the school. While the Discharge Book contains an index of correspondence from 25 February 1869, it contains none of these letters. This date suggests that the book may once have contained letters or admissions concerning the Newcastle Reformatory. Rev. Canon SELWYN was Anglican minister in Christ Church, Newcastle. His papers, held in the Mitchell Library, contain a summary of the Protestant girls admitted before June 1868 – ten months after the school enrolled its first inmate. The list96 was compiled after 17 June 1868,97 and is recorded in the same order as the Entrance Book. The NSW Police Gazette provides valuable information about arrests and gaol entrance books – especially for Darlinghurst and Maitland. They have been invaluable for personal or background information of those admitted during this period. It was very easy to be sent to gaol during the 1800s! The Sydney Benevolent Asylum100 has an online search facility and originals are held in the Mitchell Library. The Industrial School for Boys, the I.S.S. Vernon, operated at the same time as the Newcastle Industrial School for Girls. It was the partner institution for Newcastle and later Biloela. The Vernon records were compiled under the same act. They are invaluable in identifying the families of some of the girls whose records are missing but at least one register of admissions between approximately February 1877 to March 1886 is missing.101 If a brother and sister were arrested together, the Index for the Vernon and Sobroan, the records for the Vernon,102 and one supplementary list of boys on the Vernon in 1872,103 contributed information about their family. To date twenty-two sets of brothers and sisters have been located.104 Children from one hundred and sixty-one families were admitted to Newcastle so these twenty-two families represent just over 12% of total admissions. AO Archives Office The generic name of archives repositories and also the former name of State Records NSW. AP Absolute Pardon The ultimate reward for convicts - especially those with a 'Life' sentence. A return to England was permitted. BC born in the colony When used in NSW police and gaol records referring to NSW only and synonymous with the notation 'Native of the Colony'. CP Conditional Pardon A pardon awarded to convicts permitting their freedom within NSW. No return to England was allowed. ISS Industrial School Ship In NSW these ships were the Vernon and the Sobraon. M Muster Any references on this site are almost always convict musters but separate army musters do exist. NC native of the colony In the PG the usual meaning was born in NSW. ToL Ticket of Leave A 'ToL man' had previously been a convict. 4. Records became available from May 2013. 8. Jane BAKER and Mary Ann DEVENEY were recommitted and appear twice in the book but no additional readmission number was attached to either of these girls. 9. A similar notation does appear in the register when the inmates were transferred to Parramatta. 13. For these girls the online index at SRNSW has ignored the admission number and recorded this second number instead. 57. The fathers of two illegitimate inmates have been identified. 76. These girls were likely to have returned to their parents but this was not specified in the record. 101. Confirmed by SARNSW during 2015. 105. Pre-separation records for Victoria and Queensland may appear in the NSW indexes.